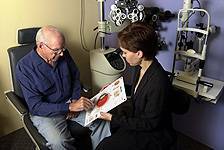 Regardless of your age or physical health, it’s important to have regular eye exams at Buena Vista Optical. During a complete eye exam, your eye doctor will not only determine your prescription for eyeglasses or contact lenses, but will also check your eyes for common eye diseases, assess how your eyes work together as a team and evaluate your eyes as an indicator of your overall health. Buena Vista prides itself on caring for our patients with the highest level of technology available. Our eye doctor, Dr. Todd Sims, answers questions about our new Marco Nidek Phoropter, which makes having your eyes examined and getting the most accurate prescription a breeze. 1) Please describe what the Marco Nidek Phoropter is used for and give a basic sense of how it works. The Marco Nidek Phoropter is a new a very new type of technology in Eye care. This state-of-the-art equipment is not only capable of measuring a patient’s prescription, but can also measure eye alignment and how well the eye muscles work together. The phoropter is fully controlled using a small portable keypad that allows rapid lens changes and completely replaces the old method of flipping lenses by hand. With this updated refraction technology, determining the refractive error of the eye is simply a press of a button. 2) Isn’t an old fashioned phoropter good enough to measure refractive error and determine a person’s prescription, why is an advanced automated autorefractor necessary? There have been many instances where patients have stated they have left other eye care practices upset since their child was unable to complete the eye exam and that they admire our practice for the sole reason that we are capable of completing the whole eye exam on their child without any complications. Aside from the doctor, partial credit is definitely given to the automated auto refractor. It is essential in our practice, due to the large volume of children we see daily. With an old fashioned phoropter there are various areas where error can occur. For example, finding a starting point can be tricky and time consuming without an autorefractor reading or an old glasses prescription from the patient. It can be especially difficult when dealing with patients who state they “need” glasses, but in reality they don’t. This is very common with children. There are many circumstances where the child’s response fluctuates or even worse; no response at all since the child is unable to distinguish the letters or shapes at his or her age. Overall, as long as the patient is able to cooperate, an auto refractor isn’t a necessity. However, one does not live in a perfect world. There are a variety of different people. Each unique, with their own special needs. Therefore, in order to be able to serve a diverse population an automated autorefractor would be ideal, equaling in a larger amount of happier patients even if the patient is unable to respond or is not being compliant. 3) Beyond helping in determination of prescription, can an automated Marco Phoropter help discover eye diseases and disorders? Yes, for one the Marco Phoropter can help find focusing problems such as accommodative dysfunction. In some cases patients with accommodative dysfunction will find that they have a hard time seeing far away right after doing long hours of near work. They will also notice their vision fluctuate after long hours of near work. There are many levels of accommodative dysfunction such as convergence insufficiency, divergence excess, and diplopia, which can all be detected and diagnosed with the help of the phoropter. The fact that the Marco TRS 5100 is so patient and user friendly was definitely worth the investment. The Marco TRS 5100 allows our practice to run smoothly and efficiently. Also, the older phoropters would make it difficult to refract someone with a very high and uncommon prescription. This can be more time consuming. However, the Marco Nidek Phoropter has a wide range of lenses that can all be easily changed with a push of a button thru the portable touchscreen keypad making exam time faster and more effective. 5) Can you describe the patient experience when using the Marco Nidek Phoropter? The patient experience is definitely taken to the next level. The patient’s reaction when they are shown their new prescription compared to their old prescription with only a push of a button, is really what convinced us that the investment was worth it. The patient’s reactions are absolutely priceless specially when it is their first time experiencing clearer vision. Absolutely! Many patients have never seen such technology at other practices and from the moment that they walk into the exam room, they really take the time to appreciate the technology and advancements. The Marco TRS 5100 really differentiates us from other practices in our area. Patients either show their appreciation of the practice’s uniqueness verbally or thru their facial expressions. 7) To what patients do you recommend using the technology, or is it a part of every eye exam? We offer this technology to all of our patients. The Marco TRS 5100 is part of all our exams rooms in the practice. Every patient is tested with all of our state-of-the-art equipment. The patient will start out with the Marco ARK automatic refractor/keratometer where a subjective reading of the patient’s prescription is measured. Then retinal photos are taken of each patient with the Nidek AFC 330 automated fundus camera. The patient is then taken into one of the exam rooms where they will find the Marco TRS 5100 automated refracting system, which the doctor will utilize in order to finalize a patients prescription.